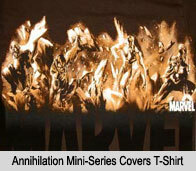 In 2016, Hot Wheels released a set of cars to promote Marvel's Civil War II series. One of the cars was Nova! The car was designed by Bryan Benedict. 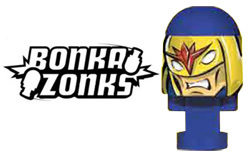 In June 2012, Hasbro released the Bonka Zonks game. One of the characters in the Marvel Bonka Zonks set was Nova! 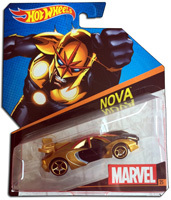 Nova was part of the Series 1 release (#98). 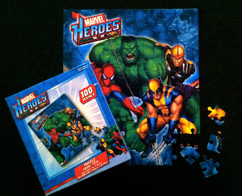 In 2011, a series of puzzles were released under the name of Marvel Heroes. 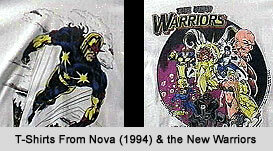 Nova was featured on one of them along with Spider-Man, Hulk and Wolverine! Special Thanks to Basil Christi for the scan! 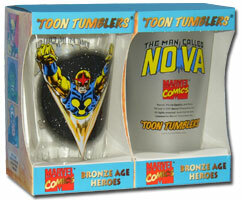 In October of 2007, PopFun Merchandising released the Nova Toon Tumbler! The heavy duty glass features an image of Nova from the cover of The Man Called Nova #25 on the front. The back side of the glass contains the original Man Called Nova logo, the Marvel Comics logo and the Toon Tumbler logo. The glass was available in two versions - clear (left in picture) and frosted (right in picture). The Nova cup was released in 1977 by the 7-11 convenience stores as part of the Marvel Series of Slurpee cups. The image used was taken from the cover of The Man called Nova #5 drawn by Jack Kirby.